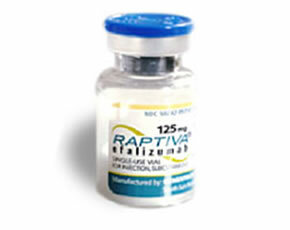 The T-cell inhibitor efalizumab (Raptiva) has demonstrated efficacy in the treatment of moderate to severe plaque psoriasis. However, it has not demonstrated efficacy for the treatment of psoriatic arthritis and, in one study, was associated with worsening of arthritis symptoms. Only a minority of individuals with psoriasis have a concomitant inflammatory arthritis, making therapy with efalizumab an option for the treatment of a large number of psoriasis patients who have no articular involvement. Here, Viguier et al (Arthritis Rheum 2008; 6(58):1796) report a case series of psoriasis patients with new-onset psoriatic arthritis temporally associated with therapy with efalizumab. Members of 12 dermatology departments throughout France known to prescribe biologic therapy for psoriasis were queried for patients with inflammatory arthritis after initiating efalizumab therapy. Follow-up questionnaires were then sent to patients and practitioners regarding past history of psoriasis and treatment, current and past articular and extra-articular signs and symptoms of psoriatic arthritis, and outcomes of arthritis symptoms with withdrawal or continuation of efalizumab. ANA, RF, anti-CCP, and HLA-B27 were measured. Sixteen patients were identified with inflammatory arthritis symptoms after beginning efalizumab for psoriasis. Patients were between 28 and 60 years of age (mean age 50 years) with an average duration of psoriasis of 16 years (range 3 to 37 years). Only 1 patient had a family member with a history of inflammatory arthritis. Arthritis symptoms began a median of 11 weeks after initiation of efalizumab (range 1 to 48 weeks). Most commonly affected joints were, in descending order of frequency, knees, DIPs, spine, enthesitis, and dactylitis. Almost half of patients demonstrated both axial and peripheral symptoms. No patients had high titer RF, anti-CCP, or ANA. Only one was HLA-B27 positive. Only one patient had a past history of inflammatory joint involvement. The severity of arthritis symptoms prompted discontinuation of efalizumab in 11 patients. Most of these had improvement in symptoms after withdrawal, although NSAIDs and other DMARDs were required in all but one. Two were treated with TNF inhibitors, with improvement, due to persistent disease activity after withdrawal. Two patients had a re-challenge with efalizumab, both with relapse of arthritis within a time frame similar to initial onset. An estimated 450 psoriasis patients received efalizumab in France over the time-period of the study, resulting in an estimated incidence of de novo psoriatic arthritis of 3.5%. New onset psoriatic arthritis appears to be temporally associated with efalizumab therapy in patients with psoriasis. Although still a rare occurrence, patients and prescribers of efalizumab should be aware of this potential side-effect. Because some patients with psoriasis will go on to develop psoriatic arthritis during the course of their disease, often after years to decades of psoriasis, it is impossible to definitively determine whether the onset of inflammatory arthritis was causally related to the drug in every case, or the natural history of their underlying disease. However, the close temporal relationship in many, but not all, cases and re-emergence of symptoms with re-challenge is supportive of a causal relationship in some patients. Further experience with the drug may aid in identifying risk factors for incident psoriatic arthritis, such that the drug could be avoided in those at highest risk. In addition, these findings may suggest clues to the pathogenesis and inter-relation between the mechanisms underlying skin psoriasis and psoriatic arthritis.